Four months into the year, I'm going along okay with the Expert Challenge, having tried several new authors, and books from or set in several countries. 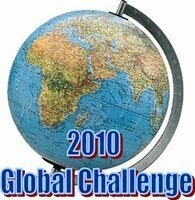 I am just about to start my 14th and final crime/thriller novel for the challenge (although, as I mentioned earlier, there is perhaps a case for another higher level to be created, adding a 3rd novel to the six main continents, and a different country for Europe, Asia, and Africa, for a total of 20 novels from at least 15 different countries). Originally my 13th novel was Douglas Preston and Lincoln Child’s THE ICE LIMIT, set in Antarctica - my second Antarctica novel after Matthew Reilly's ICE STATION. However, partway through I came across a New Zealand author from days gone by who'd written an Antarctica-set novel that was more crime/mystery than Preston and Child's book - which seemed more all-out action leaning to sci-fi type thriller. So I switched. WHITE FOR DANGER by David Stevens (1979) starts in New Zealand and heads to Antarctica, as renowned writer and adventurer Logan Adams is roped into tagging along with his brother-in-law's Antarctica expedition - his brother-in-law was the sole survivor of a previous mission, and he's determined to go back and find the two men left behind, that he believes are still alive and were taken to a hidden city on the frozen continent. The wealthy backers of the return expeditition aren't worried about finding the men (who they presume are dead), but are very interested in the potential archaeological find. But (of course) there is much more than meets the eye to the motives of those on the expedition, and other outsiders as well. During the perilous journey to the target area a series of disasters which seem like sabotage effects the already strained relationships of the team. Even worse awaits them once they reach their destination. The author is/was a Canadian-born New Zealand writer. 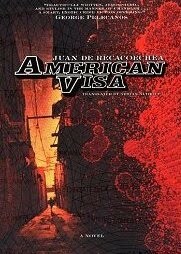 My 14th and final book for the Expert level of the 2010 Global Reading Challenge (and my second South American crime/thriller novel) is AMERICAN VISA by Juan de Recacoechea. I understand it is one of the few Bolivian books ever to be translated into English. Apparently a 'noirish' tale set in La Paz, it won the National Book Prize in Bolivia in 1994. Mario Alvarez, an English teacher from the provinces of Bolivia, arrives at the zero star Hotel California in La Paz wearing his best suit and clutching a round-trip ticket to the U.S. sent to him by his son. He meets Blanca, a prostitute with cinnamon skin from the tropical part of Bolivia who "had within her the serenity of the great rivers that run through her homeland." Blanca falls for Mario and offers him a more realistic future than the vague promise made by his son, but Mario is obsessed with getting to the U.S. When it becomes clear the authorities will investigate his faked documents, Mario needs to "expedite" his visa problem. Coming up with the harebrained idea of robbing a gold buyer for bribe money, he proceeds to land himself in various inglorious situations. He draws on his experience with American crime fiction--Chandler, Hammett, and more--to steal the money any way he can, even if he has to kill to get it. I'm quite intrigued by this - it doesn't seem your standard crime fare, so I will be interested to see how I respond to AMERICAN VISA. American Visa sounds as an attractive choice to me. I will like to hear what you have to said also.